Critic Ken Frampton’s analysis of Archigram is uncompromising. As a movement its importance lay more in the lineage (Buckminster Fuller, Cedric Price, Peter Cook, Norman Foster arguably culminating in Piano’s and Rogers’ Centre Pompidou), than in the theory. Unlike Orwell 20 years earlier, or even Calvino in the middle of the hi-tech explosion, Archigram’s prophecies on how we might live in the future tended to be quite wide of the mark, and Frampton underlines this. 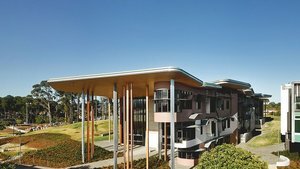 Given Peter Cook’s role in the movement that led ultimately to the ‘systems’ now have at our disposal, the choice of materials at the new Abedian School of Architecture at Bond University in Queensland is interesting. CRAB, Cook’s practice with Gavin Robotham, uses noticeably ‘low tech’: plywood wall and ceiling lining (perforated as needed), cast in situ concrete and grey carpet all combine comfortably with a little accent paint – orange walls and yellow door leaves and jambs – that recurs in expressive plywood furniture, also designed by the architect. The simplicity of this palette is a genuine strength of the building and the rigorous and obviously determined use of concrete (walls, floors and ceilings in some spaces) is strong. Admittedly, a perfectionist like Tadao Ando would have rejected the quality of almost all the irregular shaped and often sloping walls or ‘scoops’, but that is more an indictment of the declining quality of in situ work in Australia than anything. The overarching attitude that Fosroc (liquid paper for concretors) will fix anything is evident on most of the concrete walls. I empathise with the architects, as I seem to spend half my time knocking back concrete work nowadays. The ambitious shapes of the primary walls in the Abedian School, while certainly sensuous, probably don’t help. Yet as I stood marvelling at the cathedral-like volumes of the internal street there, the sun pushed through a clerestory window and hit a curved concrete wall, bringing it to life for a moment. The parti of the building revolves around the street that runs east/west from front door to back. It’s a reliable model for design schools – main street, studios on one flank, services and offices on the other, cross- pollination, congregation, socialisation, exchange of ideas down and around the spine. Born out of a particular position on teaching design, the street is the primary organising device of the building. The ‘scoops’ that are the main structural elements cause small meeting spaces at their base. There is a sensibility for users that extends to plywood bench seats around the edge of the meeting spaces, the lids of which fold up to reveal storage space. Of all the spaces I like these the most because they humanise the otherwise vast street/studio zone. The street runs gently on grade rising from east to west. South facing studios run over two levels and are connected back to the north side core by a couple of bridges. These are a nice voyeuristic touch, providing a spot to oversee the activity below, and help maintain fluidity of movement. They also help give an appreciation of just how much of the building is un-programmed volume. The floor to ceiling dimension through the street ranges from 9m-13m down its length. Internal concrete walls: is heat sink capacity what you need in sub-tropical Queensland? A climate where outdoors is everything. I like buildings that can only really be figured out by being explored. At the Abedian School the plan becomes self evident soon after entering and the back door can be seen in the distance. Why bother to embark on a journey through a building, the prescribed purpose of which is to be stimulated and engaged when everything appears to be on offer within the first few metres of entering? Journey. Destination. Reward. Orchestrated space requires all three to succeed. Furniture design and consistency of detail are solid throughout the building. To the right of the main entry is a small café and an external door to an unstructured outdoor space. Immediately above this zone are staff offices and meeting spaces that project over each other back towards the east, providing a small amount of articulation adjacent the main entry. The Cook ‘nose’ gag. The scale and seamless fenestration of the ‘nose’ rooms work well and give them an intimacy that contrasts with the public realm of the building. Queensland’s climate ranges from sub–tropical to tropical, south to north. In the first week of winter when I visited it was 25 degrees and the inside of the building was humid. I worked up a sweat wandering around. One of the problems with in situ concrete is that performs badly thermally on external walls, though the architect argues for its ‘heat sink capacity’ when used internally. The climate in coastal southern Queensland is so mild that any argument for thermal massing is dubious, and contrasts heavily with the lightweight approach of Australian architect Glenn Murcutt, who uses materials that don’t retain heat at night. He employs a fairly basic principle of cross ventilation and shade to limit heat gain during the day and off load heat quickly as the sun goes down. These principles have been adapted by others to suit an even milder climate 1000km north of where Murcutt builds in New South Wales. I couldn’t find any proactive climate based strategy for CRAB’s building envelope, which is cooled by a conventional HVAC system and standard heat recovery design. Australia’s Greenstar energy rating system covers all non-residential building types, including educational, and a high rating is seen by most universities as mandatory. CRAB says that the aspiration for a Greenstar rating was ‘value engineered’ out of the project altogether. Although working hard to disguise the fact, the plan is orthogonal – a rectangle divided into a third and two thirds by a central corridor. The free-form that begins and ends at the east and west entries suggests a third dimension equally organic, although all the external walls except the ‘nose’ meeting rooms project straight up and their height make the massiveness of the concrete appear almost paper thin. CRAB added a domestic element – an eaves overhang – via a series of flat roofs with plywood soffits. Interestingly they provide an overhang to the glazing on the south, east and west sides which performs no apparent function. The overhang is too high to provide any real shelter from sub-tropical rainstorms. The conventional rule for a cantilever (one third overhang, two thirds backspan) is forsaken for a redundancy of composite timber and steel posts that also support a number of downpipes. To the south the posts land on a concrete hard stand met by a rolling hillock of grass. At its base, the attractive shallow sine curve concrete seats are the only human scale objects around the entire southern perimeter of the building. The north (sunny) side consists of a series of relatively small window openings with capricious (humorous) horizontal sun shades. Raised eyebrows, apparently. In a climate where outdoors is everything none of the internal spaces of the building extend to any structured outdoor space. Apparently an outdoor workshop area was designed and then lost due to cost, which is a pity. Archigram, though long gone as a movement, lives on in the inherited influence of building ‘systems’ and all that infers. Peter Cook can take some of the credit for that. Just where CRAB ends up in the juicy lineage of British design is anyone’s guess. It’s hard to know where to place it just yet and a challenge to locate a building like the Abedian School alongside the others of the practice – the Kuntshaus in Graz and the Department of Law and Central Administration in Vienna – because superficially at least they are so tectonically detached from one another. In the Bond University building so much effort has gone into the literal diagramming of a pedagogical proposition for teaching architecture, born out of years of teaching by the firm’s two principals, that other architectural opportunities – envelope, landscape, ESD – may have been under exploited along the way. The end result is a building that has its moments and one that provides a conducive space for students and staff. Its strength lies in the fact that it is clearly a building designed for teaching, by teachers.